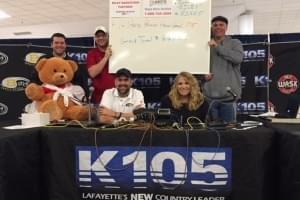 Neuhoff Media Lafayette radio stations WASK-FM, K-105 (WKOA-FM), and B102-9 (WXXB-FM) came together for one cause: Riley Hospital for Children. The two-day, 18-hour Riley radiothon raised $66,155 for the Riley Children’s Foundation. This is the second year the three radio stations have collaborated for this event. Last year, the three stations raised over $53,000 for the Riley Children’s Foundation. For more information on Riley Children’s Foundation visit http://www.rileykids.org.